You may think of truffle as something that only grows in Italy and France. Indeed, the most well-known tubers are the black from Périgord in France (Tuber melanosporum) and the white from Alba in Italy (Tuber magnatum). However, there are actually a bunch of other less famous locations around the world, where this edible black gold can be harvested. The most unlikely, perhaps, is far up north at the island of Gotland – Sweden’s largest isle. Here, the Burgundy truffle thrives, but is known as the autumn truffle or Tuber uncinatum. 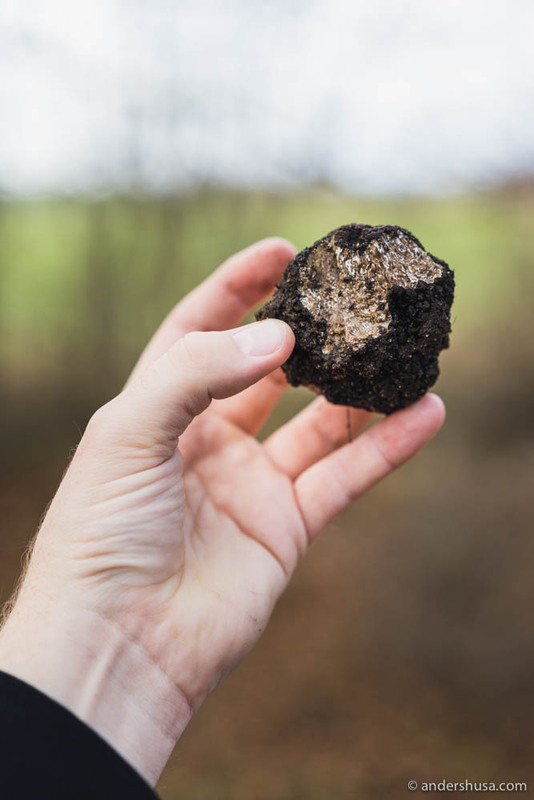 Although, technically the same species as the black summer truffle (Tuber aestivum), it is harvested later and has a slightly stronger aroma. Every year, from October to December, between 700 and 800 kilos are found. Looking for great spots to eat on the Swedish island? 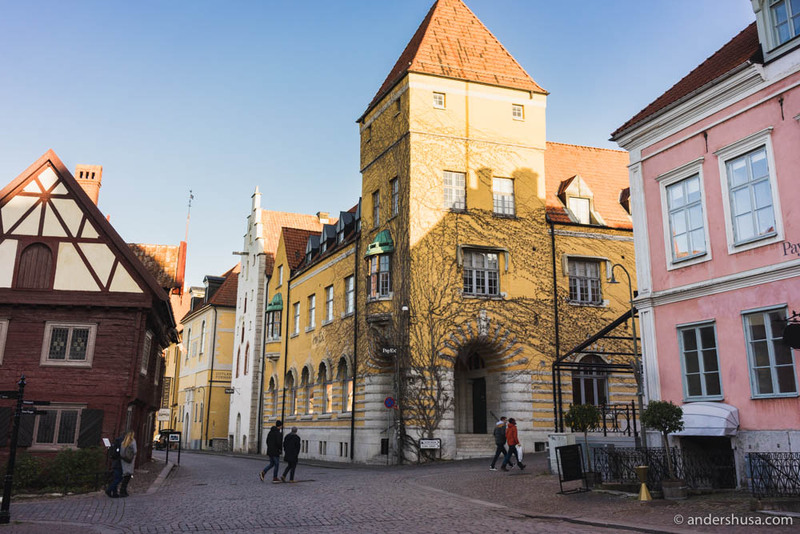 Check out my guide to Gotland! The value of truffles is determined by their size and aroma. While the price of the most uncommon truffles may be as high as 50.000 SEK ($5500) per kilo some years, the Swedish sibling is much more affordable (usually around 5.000-10.000 SEK ($550-1100) per kilo), but also less aromatic than some of its continental brethren. These rare delicacies are like picky princesses – they prefer to rest in the upper layer of the soil near the roots of oak or hazel trees. Here, they form a so-called mycorrhizal relationship with the tree, exchanging their valuable nutrients in return for sugar and carbohydrates. 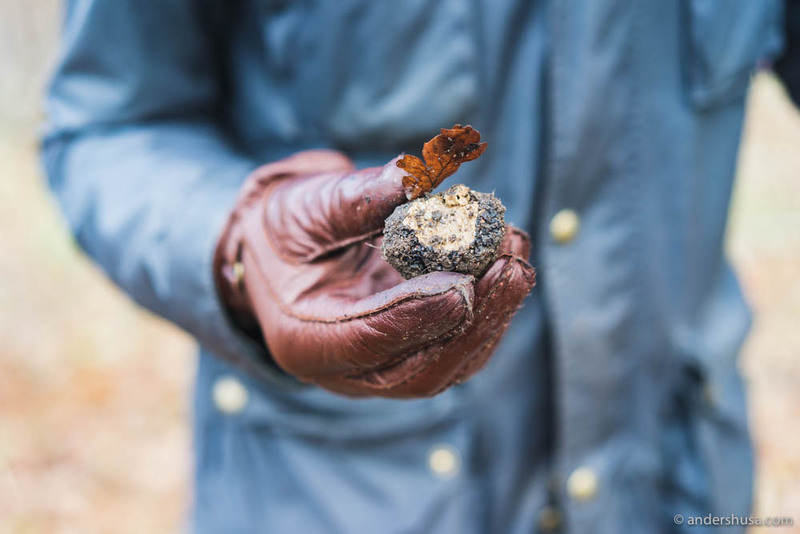 As the truffle grows, the aroma gets stronger in order to attract birds, rodents, and other creatures. They want to be found and eaten by animals, because the spores can survive the passage through the digestive tracts, and, thus, be spread to new soil. Due to their good sense of smell, pigs and dogs are used by truffle hunters to locate the luxurious mushrooms. However, dogs are easier to train, as well as handle, to make sure they don’t eat the truffles when they find them. 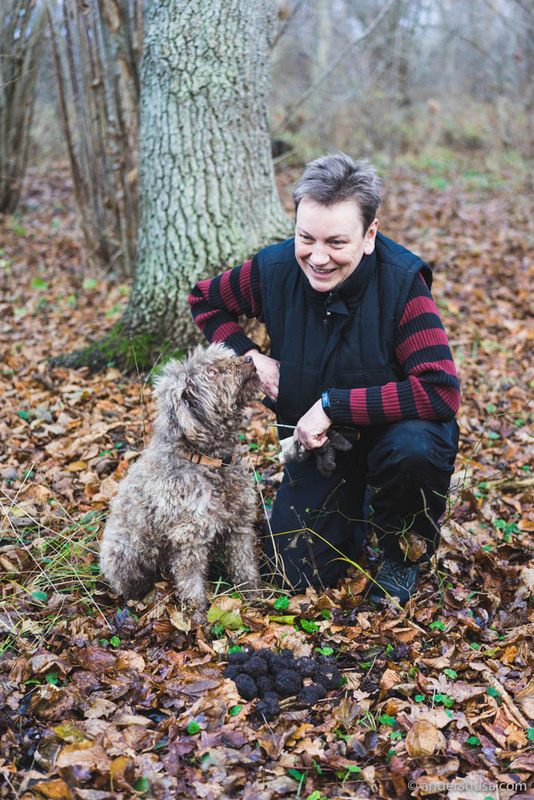 I was on Gotland during the truffle season and was lucky enough to take part in one of the annual truffle searches of Susanne Welin-Berger and her dog Marre. The Lagotto Romagnolo breed is known for their sharp senses which makes them perfect gold diggers. 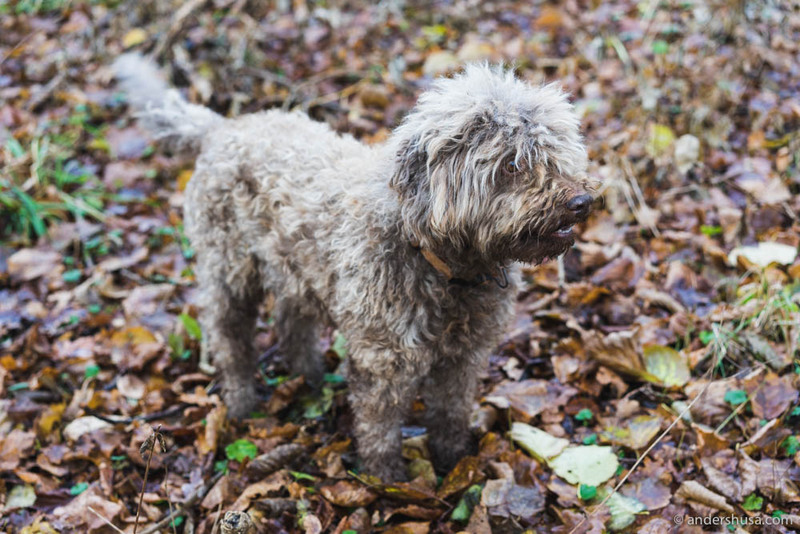 Marre was 10 years old at the time and already a skilled truffle hunter. He had recently taken over from the couple’s previous tuber chaser of the same kind, Bruno, who was 13 years old but, unfortunately, had a limp. I could sense a theme with the dog names. Marre, from the French word marron, and Bruno from the Swedish word brun, both means brown. Brown is the color used to describe the Gotland truffle, as opposed to the darker black-colored French species. It was fascinating to watch Welin-Berger and Marre work in a team. She would let him run free around the forest and he would go straight for the nearest underground stinker. There was no hesitation in his path. Once he started digging in the dirt, she had to be quick. Even though Marre was trained not to eat the truffles he could easily be tempted to take a bite of the gourmet gold from time to time. – If he chews it, he gets no snack, Susanne laughed. The same rule applied if the truffles were not fully grown tubers. On this particular morning, Marre did well, and only left teeth marks in a few shrooms. He mostly found big ones! At the end of the hunt, I purchased 300 grams of the morning’s catch. Since it was directly from the supplier I got a good price – SEK 1.500 which is a kilo price of only 5.000 SEK (€550). I used it, among other things, on top of homemade egg ravioli. Marre took a big bite of this one! Welin-Berger doesn’t own the ground where she goes hunting and has to pay the land-owner 1.000 SEK (€110) per kilo truffle she picks. Together with her husband Olof Thomsson, and three other families on the island, she has co-founded the company Tryffel of Sweden. An organization that cultivates and works with truffle in multiple ways. They organize seasonal truffle hunts for those interested (like me) and make a variety of truffle-related products (honey, butter, mayonnaise, oil, salt etc.) which they sell. 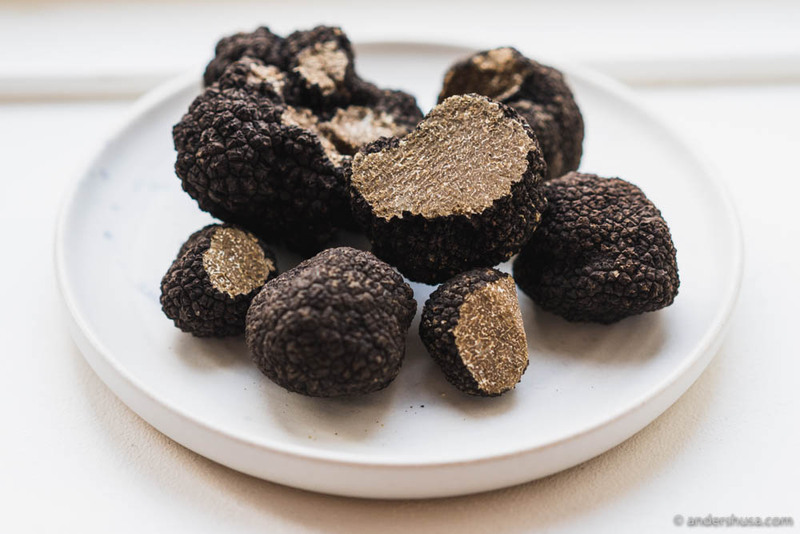 Truffle doesn’t actually have much flavor, it’s all aroma, and that can easily be transferred to other liquids or solids – even eggs without cracking the shell. 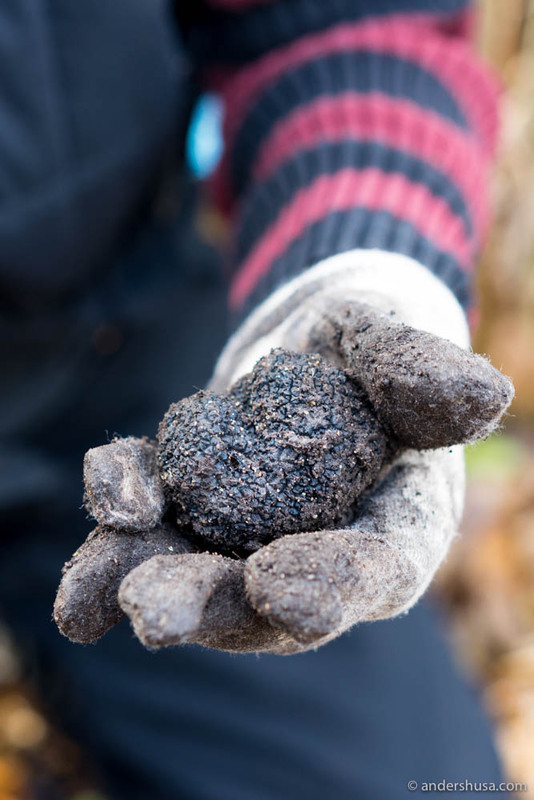 Furthermore, the organization is involved in Gotlands Tryffelakadami which hosts an annual truffle festival with a related ceremony and dinner. 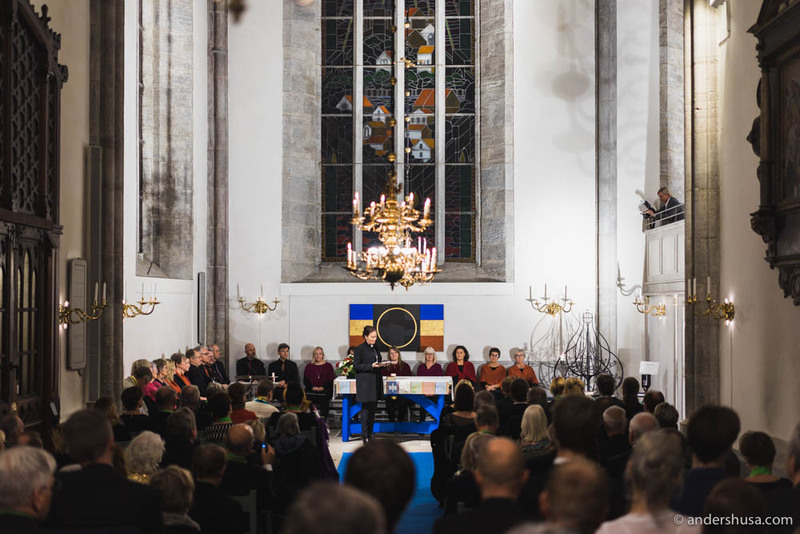 The ceremony, which has a semi-religious, almost cult-like vibe over it, takes place in Gotland’s cathedral in the city of Visby. All new participants are knighted and receive a medal. I am proud to say, that I am, forever, a knight of the black truffle! Titti Qvarnström was awarded the truffle chef of the year on this occasion. At the end of the day, we enjoyed a 10-course truffle dinner hosted by the truffle chef of the previous year, Henrik Norström, and the nine restaurants that make up Kulinariska Gotland. The dinner was fine, but I much preferred the simpler courses we enjoyed the day before at restaurant Gamla Masters. 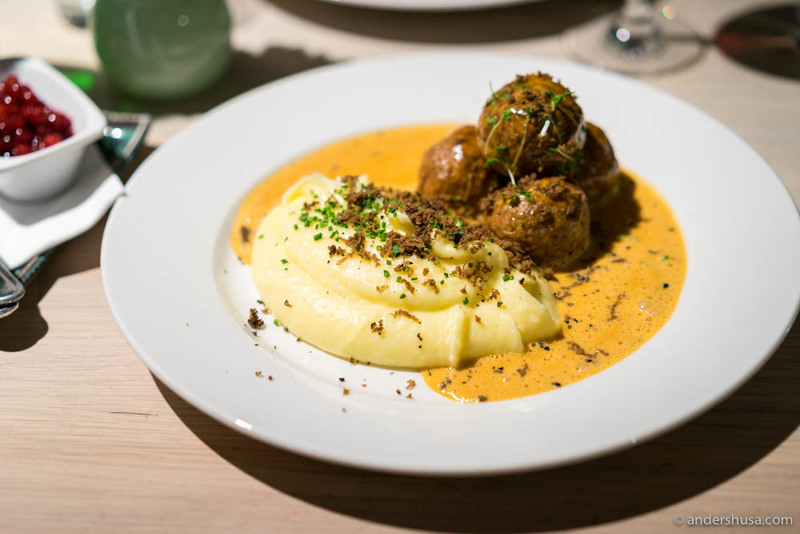 Classic Swedish meatballs with potato purée and a copious amount of truffle shaved over. Rustic and hearty with a touch of luxury. Life is better with truffle. Want to read more about the event? Check out my friend Lars Spiser’s story (article in Norwegian). 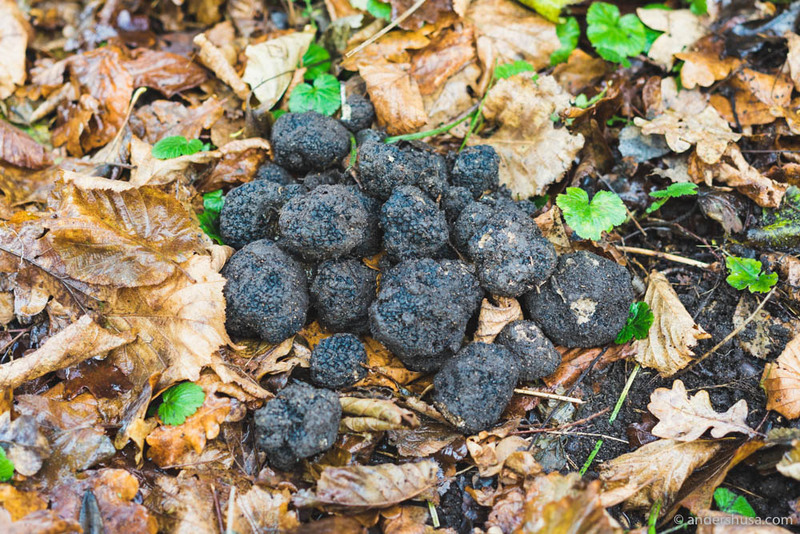 Have you ever gone truffle hunting? Please leave a comment below. This was trip was sponsored by Visit Sweden. The sponsor had no influence on the content of this article. I received no monetary payment. Thanks! Happy you liked it.